Sometimes, the very best stories of humans helping animals can be told with no words at all. 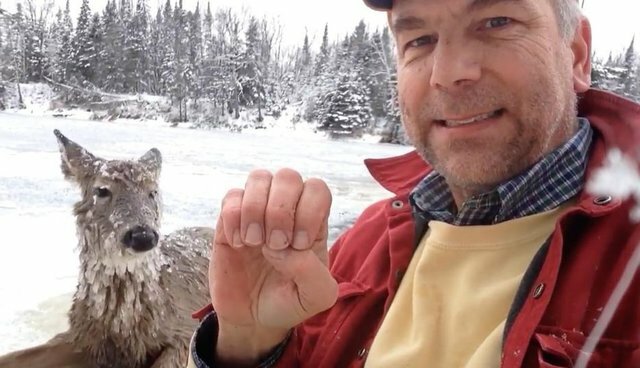 On Tuesday, Reddit user ceejface shared this touching footage of a family friend, who is deaf, describing in sign language the harrowing rescue of a stranded deer that took place moments before. Meanwhile, the animal whose life he saved is seen sitting calmly by his side, exhausted but lucky to be alive. YouTube user Chris Haulmark has provided captions of the man's telling in American Sign Language. It's unclear from the video what happened next to the deer, but by the account of this unnamed hero, she escaped with her life - and a new name - all because of him. "I will call her Miss Ice River," he says. "She must be so cold. I am so happy that she survived."